For some reason, over the last few days I’ve heard a lot of people criticizing GMOs for not increasing crop yields. This criticism certainly isn’t new. I don’t really understand the reason for the sudden resurgence of this claim, but it does provide an excuse to address the topic with some actual data. If you take a broad look at national level data in the US, it is difficult to make a case that GMOs, as a monolithic entity, have had a dramatic impact on crop yields. But I can think of very few traditional plant breeding efforts that have led to a “quantum leap” in crop yields across the board. Perhaps the dwarf trait in wheat could be credited with this type of shift, but it has been well over 40 years since that discovery was made. If the inability to generate a “quantum leap” in crop yield is a failure of crop biotechnology, it is also a failure of traditional plant breeding methods. Does this mean we should stop investing money in traditional breeding efforts? Certainly not. Why should we expect GMO crops to have this kind of impact? Traditional crop breeding tends to move slowly, incrementally making changes that improve some aspect of the crop. Perhaps it is better flavor or nutrition, but more often, traditional crop breeders are focused on disease and insect pest resistance. And those efforts tend to be pretty regional in nature. A wheat variety in the Pacific Northwest experiences much different environment compared to the dryland production system in southwest Kansas. Because the yield potential and pest problems in those regions are different, we wouldn’t expect a trait that is beneficial in Kansas to be equally beneficial in other regions. It is unlikely that any single trait introduced by any method, traditional or biotechnology, to dramatically increase yield when we look at national level trends. Up until now, biotech seed developers have been focused in the same place as many traditional breeding efforts: pest management. When you consider the GMO traits that are currently on the market (mostly glyphosate herbicide resistance and Bt insect resistance), there is really no reason to think we’d see a dramatic spike in yields across the country. Both of these traits are intended to help farmers manage pests (weeds and insects). So the only reason we’d see an increase in crop yields due to these traits is if we didn’t have adequate tools to manage those pests prior to the introduction of the GMO traits. For corn and soybean in particular, it is not at all surprising we’ve not observed major yield increases due to these traits. Corn and soybean represent huge market opportunities for pesticide development, and therefore, many tools were already available to manage weeds and insect pests in those crops. But there are situations where GMO traits have contributed to major yield increases. Anyone who knows me, knows that I do a lot of work in sugarbeet. 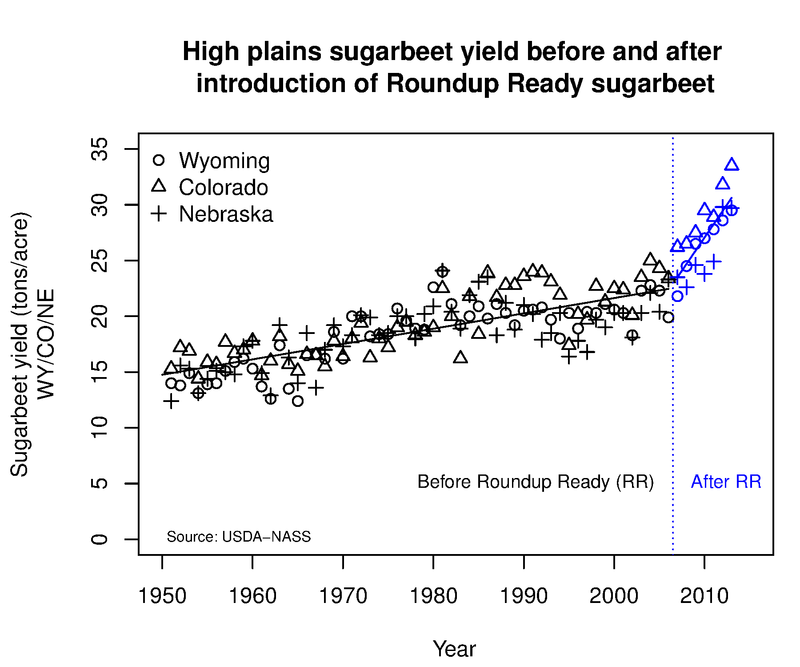 And sugarbeet is a crop that, before the introduction of GMO glyphosate-resistant varieties, had relatively poor tools available to manage weeds. Most fields were treated with several herbicides, multiple times during the season. Even then, it was common to require hand labor to remove weed escapes. The herbicides we used were also phytotoxic to the crop, so even if we got good weed control, there was potential for reduced crop yield due to early season crop injury. But this potential for crop injury isn’t the same in all sugarbeet growing regions of the US. In the High Plains region of Wyoming, Colorado, and Nebraska, the light soils and dry climate increase the potential for crop injury, while also reducing weed control efficacy of the herbicides. So what happened to sugarbeet yields after the introduction of Roundup Ready (glyphosate-resistant) sugarbeet? Again, we can’t attribute all of the gains to the Bt insect-resistance trait, as other factors probably contributed. But it seems to me, that there is pretty strong evidence that GMO traits have indeed contributed to increases in yield in certain crops grown in certain geographies. GMO traits are not the “silver bullet” that many critics hold as the necessary standard for success, but they have been a very valuable tool for 18 million farmers worldwide. Farmers who grow minor crops and farmers in the developing world stand to gain most from GM traits aimed at pest management, because those farmers are least likely to have current access to adequate pest management tools. It would be a shame to deny them the benefits of biotechnology simply because they have failed to meet some unreasonably high, broad-scale expectations in our country. Most experimental field tests and farm surveys show that Bt crops produce higher yields than conventional crops (table 4). Intuitively, Bt adopters are more likely to obtain higher yields than nonadoptersby controlling insects and thus reducing yield losses to pests. The yield gain of Bt crops has become larger in recent years as new Bt traits have been incorporated into the seeds and multiple (stacked) traits have become available. 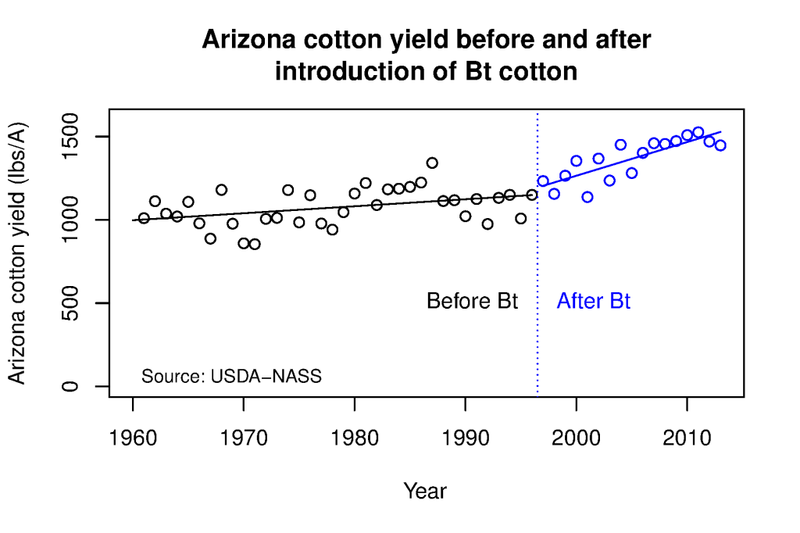 For example, ARMS data show that the yield gain by Bt corn adopters relative to conventional varieties increased from 12.5 bushels per acre in 2001 to 16 bushels in 2005 and 26 bushels in 2010. Previous Article Are herbicides responsible for the decline in Monarch butterflies?